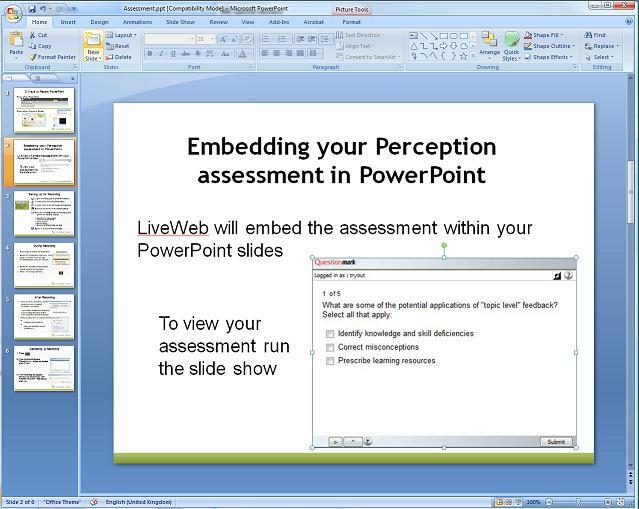 Embed a Questionmark Perception assessment, survey or quiz within Microsoft PowerPoint using Live Web. To see how this would look, see a snapshot of an assessment embedded within PowerPoint. Live Web is the Microsoft PowerPoint add-in which enables users to insert web pages into a PowerPoint slide and refresh the pages real-time during the slide show. Perception assessments can easily be displayed using Live Web: all you need to do is insert the Perception assessment URL. You don’t need to add code.